Love the display of the Moto X. The display on the Moto X is extended out closer to the edge of the smartphone than the Photon 4G. The result is a larger display screen without the need for a larger physical smartphone. The Moto X is thinner than the Photon 4G, which will take getting used to so I don't drop the phone. The only physical buttons are the power/lock button and the volume toggle. No camera button, which was rarely used. Going to miss the kickstand on Photon 4G. I used it as a cost effective way of balancing the phone near the air vents (only the heat is NOT on) of my car for Google Maps navigation. Without a kickstand, I'll have to find another way to get navigation. Even though the Photon 4G had a suite of applications designed around the kickstand, I disabled it using it only for in-car navigation purposes. The back of the both the Photon 4G and the Moto X are both rubbery, creating friction to reduce sliding on a table surface. However, the rubbery back works much better when that semi-rubbery surface of the phone is flat (as in the Photon 4G). 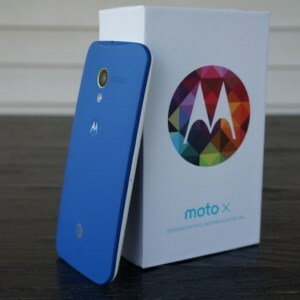 The Moto X however has a curved back, so the rubber surface makes less contact to the table and even wobbles. I prefer a flat back with the rubbery backing. Just a change I'll get accustomed to. Much faster than the Photon 4G. Given I'm comparing a 2 year old phone against a new phone, this is nearly impossible for a new phone to get wrong. I immediately experienced improvements in home screen scroll speed, application bootup speed, and even gameplay speed (for example in Candy Crush). One reason I was upset with being stuck on Gingerbread on the Photon 4G is it did not support Google Now. Now that I've tried it for a day, I feel the "cards" are bit overhyped. It's not quite as helpful as I imagined it would be. Voice Search is multifold better in both voice recognition accuracy and speed. Have the whole "Ok Google Now" to perform a voice search without unlocking the phone will be helpful when I use voice search the most... searching for Google Navigation driving directions based on an address. Currently on my Photon 4G, I have to unlock and search. Now I can just search from any state! No word on how this feature will affect battery life. The notification system is changed (not sure yet if for better or for worse). On the Photon 4G, it was a single LED that would blink either green (for notifcation) or red (for low battery). This would leave the screen off and in my opinion was great for battery life. The Moto X display slowly blinks (but the display only lights up the necessary pixels to preserve battery life). It also supposedly doesn't blink when in your pocket. This is likely to have a bigger impact on battery drain, but on the upside provides more details information on the notification. I ordered the Moto X online, starting from Sprint.com and ending up customizing the purchasing from the official Moto X website, invoiced to my Sprint bill. Next the series of successful and fast steps and notifications I received. All in all, I was very happy with online purchase and activation process. Thursday, Nov 21, 2013 - Purchased the phone online at around 9 PM. Received a confirmation email stating the Moto X should arrive by Nov 26 (with an * that delays may occur depending on shipping location). Saturday, Nov 23, 2013 - Got an email notification that the phone had been shipped, to arrive Nov 25 via FedEx with a tracking code, no signature necessary. Monday, Nov 24 at around 2 PM, the package is deliver and left on the front door by FedEx (just how I was expecting it).